The Ultimate Game Chair | OhGizmo! Gamers put their bodies through so much while playing their favorite consoles what with all the controller-holding, constantly staring at the television and not to forget all the sitting too. Why not give your body a break and treat it to some real luxury? 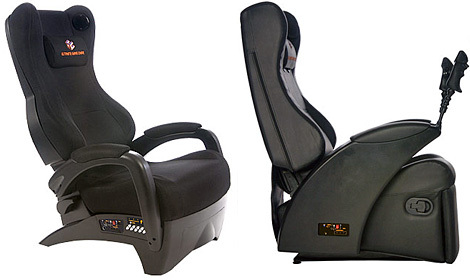 Besides looking extremely comfortable the Ultimate Game Chair also helps you feel like you’re a part of the action via built-in speakers and 12 different vibration motors that are synchronized to the game. Other features include ground effects lighting, headphone and controller jacks, beverage and remote control holders and probably the most important one, stain-resistant fabric to help keep the chair from becoming Cheetos-orange after a few weeks. The Raptor model (pictured on the left) will set you back $299 and the Ultimate Game Chair model that includes the additional joysticks (pictured on the right) will set you back $399. Both are available for pre-order at this time and should be shipping sometime this month. Got a used raptor model chair at the Goodwill for $10.00 these chairs are great. Didnt really know what we had tell i got on line and looked it up. Chair looks brand new.